Learn dos and don'ts in applying for cash loan in the Philippines from a top Pinoy loan consultant. Get free advice. There are so many varieties of uses for a police clearance. It could be for job, travel, identification, loan application, government ID application, buying property or car, deeds issuance and so on. But today, allow me to give light for those who are going to apply for police clearance for the purpose of applying for loan in the Philippines. With respect to my professional experience with assisting loan and credit borrowers, a police clearance is usually required for those co-borrowers who don’t have 2 valid primary IDs to present as part of the documentary requirements for applying for seaman loan and other types of loan that I offer my free assistance for. Currently, there are different loan offers in Manila and the rest of the provinces in the country but what is good about the new government service is that different branches and offices of the respective city hall offices are now accepting application for acquisition of a police clearance document. 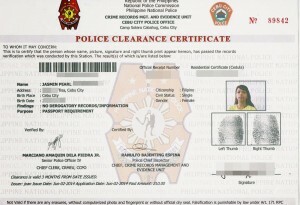 Although basically, from the many experiences of assisting loan borrowers with their application for a police clearance, I’ve had a good notion where it is fastest to secure and process an application, I would like to give a generic or usual list of the step by step processes that an application for this document must undergo before he or she can get a copy of the police clearance. If you really don’t want to take a risk of delayed process, I would like to suggest that you go get a copy at the Makati Central Police Station located in Ayala Cor. Yakal Street near the Makati Central Post Office and Makati Central Fire Station. You can acquire a copy of this document there for less than 15 minutes if you are lucky enough that the line is short but given there are so many applicants, it will still probably take you only about 30 minutes or less for the whole process up to the release of the document. Get a legitimate cedula or community tax certificate from authorized government agencies and offices. It is best if you can buy one from the nearest City Hall in your municipality. Report to the nearest Police District Station in your area. You can search for the Police Station branches by visiting the official website of the PNP headquarters here – http://pnp.gov.ph/portal/. If you are from Manila, go to MPD Office in Kalaw St. (near Savemore Grocery former Masagana Superstore. Fill the PNP application form and go directly to the receiving window. There are usually personnel in the area whom you can ask after filling up your police clearance application form. Prepare the fees to be collected. With my current experience in Makati CPD (Central Police District), my loan borrower client paid Php 170.00 as fee for the said clearance. Today, they no longer require a CEDULA but it is still best to secure one before application just to be sure. Pay your dues at the cashier window and wait for your name to be called for picture taking and thumbmark registration or fingerprinting. Wait in line for your name to be called for the input of your thumbmark via electronic system as well as for your web photo input which will be used as your official picture to appear in the police clearance document. Today, you won’t need 2×2 pictures anymore. They will take your picture using a webcam. No barangay clearance will be required to secure and apply for a PNP clearance anymore. Wait for the releasing window to announce your name for claiming your document. Please note that there are offices of the Philippine National Police that does not require so much documents to be submitted before you can apply and secure a copy of the police clearance. Below is the standard list of documentary requirements that you will possibly need before application. Whichever case if it will be needed, please make sure to have all the requirements before application just to be sure. Thanks and more power to your blog!